You are here: Home » MEDIA » Books » Stark’s Crusade (book 3) by Jack Campbell (writing as John G. Hemry) (book review). 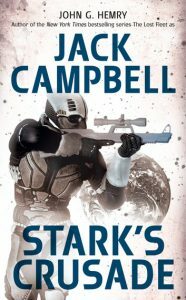 Stark’s Crusade (book 3) by Jack Campbell (writing as John G. Hemry) (book review). So, here we are with the final book in Campbell’s ‘Stark’s trilogy. After ‘Stark’s War’ we had ‘Stark’s Command’ and to bring things to an end we have ‘Stark’s Crusade’. At the end of the second book, the rebel commander Ethan Stark is left pondering what to do to avoid further conflict and resolve the impasse with the US Government after he and his troops mutinied. There’s also the relationship with the civilian population of the Moon colony as it’s not as good as it should be. In common with the previous two books in the trilogy, ‘Stark’s Crusade’ opens with a military action. The difference this time is it’s a covert one as Stark’s troops attempt to disrupt the build-up of US Governments troops and supplies at a location bordering the rebel Moon colony. It’s covert as the site is within the territory of one of the other Earth powers which technically is still at war with the US and Stark’s rebels. Jack Campbell excels at this type of thing but keeps the initial action short as it’s all done and dusted in the first 41 pages. While there is still the omnipresent threat of further action by the US, life has to go on in between the military distractions. Ethan Stark, in particular, is having a crisis of conscience as it looks increasingly likely that any future assault by the US Government’s troops will require Stark’s rebel army to fight and potentially kill fellow Americans. This is something Stark and by inference the rest of the rebel soldiers are not willing to do. This reluctance to engage fellow Americans in armed combat is driven home on several occasions but is vividly illustrated when Stark has to resolve a little local difficulty. It does mean that Stark has to revert to some unconventional means but that’s one of his traits. He has a habit of averting disaster by using unconventional methods. The local difficulty Stark has to deal with has been brought about by the US Government attempting to sow discord amongst the rebels. It’s taken awhile but they have finally reverted to non-military means in an attempt to weaken Stark’s position. They are more than willing to try and bribe key people in Starks command circle. It’s been building for most of the book so when the US Government’s troops finally launch their major offensive to crush the rebels once and for all, Stark and his troops have had a chance to prepare. Even so, Stark has to use all his and his commanders’ wits to do something unconventional. It has to be something special to comply with the seemingly incompatible drives to protect the colony while not killing fellow Americans. This final book in the trilogy wraps up the story but left me with a sense of disappointment as it’s a bit of an anti-climax. It’s all down to the almost religious taboo against fighting fellow Americans. This constrains the author’s options on how to resolve the ending so that in the end there is only one feasible scenario. When it finally comes the ending just sort of fizzles out. Ethan Stark is the main character of the story, so as you may expect all the narrative revolves around him. However, the story is much bigger than him as political, economic and military situation in the US back on Earth are the main drivers for the US Government’s responses to Stark’s military mutiny. Unfortunately, we only get a partial insight into this as Stark is firmly planted on the Moon. While Stark’s antics are entertaining, it is just a piece of a much larger event impacting the US that we need to know more about. Stark and the colony’s civilian commander do engage in a limited propaganda warfare trying to stir up the civilian population of the US on Earth, but it’s almost skipped over until the last part of the book. Even then, it’s a description of what happened or rather the result of what happened. Taken as a whole, the ‘Stark’s War’ trilogy are a good read if you like military Science Fiction. It provides an interesting view of what could happen in the near future and the technologies that may be available. The military action sequences are very well done but I’m not too sure about what happens in between. A good mix of characters though. « Avengers Infinity War (second trailer).